On International Women's Day it's important to remember that you don't have to be a man to be a misogynist. In fact, some of the worst misogynists of all are actually women. Take Theresa May as an example. She loves to roll out the identity politics to score cheap political points about the fact she's a woman, and the Labour leader is a man. But dig a little below the surface and you find that Theresa May is pushing an outrageously sexist political agenda. I'm obviously not the first to have pointed out that Theresa May saw fit to roll out the red carpet for possibly the most misogynistic tyrants on Earth during International Women's Day. It doesn't seem to matter a jot to May and her political party that Saudi Arabia is a society where women are treated with contempt, that human rights abuses there are commonplace, or that the Saudi tyrants are using British weapons to commit grotesque war crimes in Yemen. 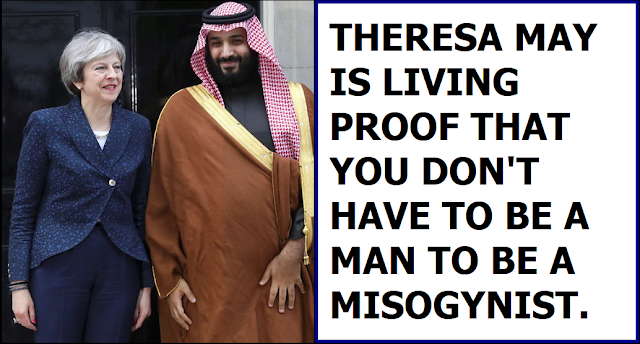 All Theresa May and the Tories are interested in is getting their hands on even more Saudi oil cash, even if that means turning a blind eye to their misogyny and actually selling them even more of the weapons they're using to commit their war crimes with. 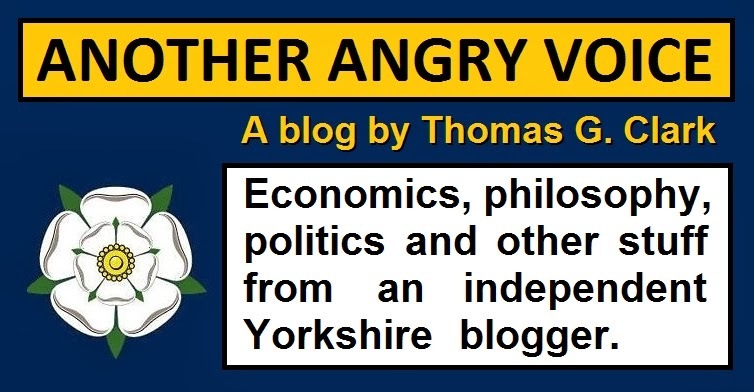 If we look closer to home then we find that Theresa May and the Tories are responsible for the implementation of profoundly sexist (not to mention socially and economically ruinous) austerity dogma. House of Commons figures demonstrate that 86% of the economic burden of Tory austerity dogma has been loaded onto the shoulders of poor and ordinary women. After a bunch of mainly-male bankers trashed the global economy in 2007-08 with their reckless gambling on complex junk derivatives that they clearly didn't even understand, it's telling that the Tory party (with the full backing of Theresa May and other female Tory MPs) decided to load the burden of the resulting economic crisis mainly onto women. What's even worse is that while they were loading the pain onto poor and ordinary women, the Tories lavished handouts and massive tax cuts on the mainly-men who created the crisis in the first place. And what's even worse still is that Theresa May is well aware that Tory austerity dogma punishes far more women more than it does men, yet since becoming leader of the Tory party she's continued deliberately inflicting this economically ruinous and profoundly sexist hard-right dogma on the British people. Even if the Tory apologists somehow tried to argue that Theresa May isn't responsible for the demonstrably sexist austerity policies her party has been imposing for the last eight years (despite having repeatedly voted in favour of them and having actually led the party for 20 months), there's also her personal track record at the Home Office to consider. Back before Theresa May became Prime Minister she imposed one half-baked piece of legislation after another at the Home Office, one of the worst being a massively discriminatory policy of imposing arbitrary income requirements on British citizens wishing to bring their non-EU spouses into the UK. Not only does this ridiculous Tory policy brazenly discriminate against British citizens on account of the fact that EU citizens can bring their non-EU spouses into the UK under freedom of movement legislation, while British citizens have to jump through all of these Tory hoops, it also discriminates heavily against women. Research has shown that setting minimum income requirements at an arbitrary level, and refusing to consider the earning potential of the non-EU spouse has resulted in a massively sexist outcome where significantly more than half of women don't earn enough to bring a non-EU spouse to the UK, while only 27% of men earn below that income threshold. Thus, thanks to Theresa May British women who fall in love with non-EU citizens are more than twice as likely to face the horrific dilemma between separation from their lover or living in exile from their own country as British men are. Theresa May repeatedly demonstrates her misogynistic attitudes. From rolling out the red carpet for the misogynistic tyrants who rule Saudi Arabia, to her party's ideological obsession with profoundly sexist austerity dogma, to her very own policy of ensuring that British women are twice as likely to face the traumatic separation vs exile dilemma as British men. Yet Theresa May and the Tories assume us (the plebs) to be so thick and easily manipulated that they think they can bypass all of this misogyny by playing crude identity politics over the fact Theresa May is a woman, and her opponent (who happens to strongly oppose all three of these misogynistic Tory strategies) is a man.